Stamp Happy Felicia: You're The Best! Hi everyone in blog land!! I can't tell you how much more surfing people's blog I do than I should be stamping. I'm so pumped up to stamp my heart out but by the time I finish surfing blogs I realize oh my how much time I've just spent on doing just that that now I don't have time to create a card. Well tonight while blog surfing I came across the CPS blog and of course had to participate for the first time in their sketches. I've always admired the blog but never taken part. So here is my card! The card base is Pixie Pink. The dp paper I'm not sure it's in one of my previous posts though cause I've used this paper on a card before. 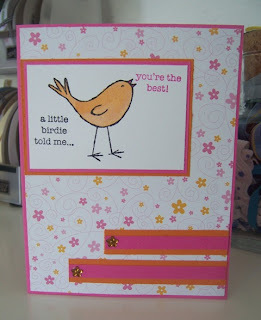 I used the stamp set call A Little Birdie Told Me by Stampin' Up! I stamped the image is staz on ink and used my watercolor pens to color in the birdie. On the two strips of paper on bottom of card I used some Queen & Co jewels the little orange flowers I thought matched perfect! I hope you all take part in the CPS challenge as well! Have a great day! Felicia - what a cute card! The colours you've used are one of my fave colour combo's to play around with! Totally cute birdie! Great use of the CPS sketch. What a fun springy card! love the birds - nice job on the sketch! Hey Felicia - don't you just love CPS - I have participated in their challenges a few times and hope to do more. I love this card - the paper is wonderful and I love the bird. TFS ! !